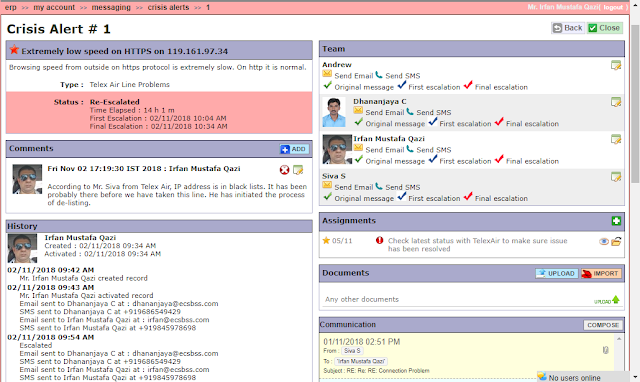 Tuhund Crisis Management Module is one of the least used modules in Tuhund and less known to customers. This is probably because risk management is not a priority for many. It is quite a strong and a very useful module, if business continuity is your priority. 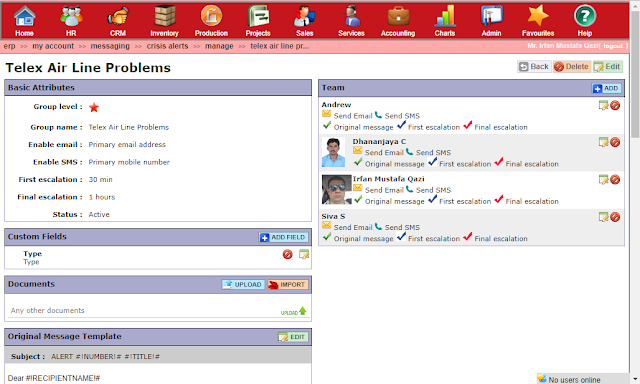 I have not come across any other ERP that has a Crisis Management Module inbuilt. That could be the reason why many customers are not using it. We intend to promote it in a big way together with several other modules that are unique to Tuhund or at least are not available in common ERP systems. The purpose of Tuhund Crisis Management Module is to plan and program action in advance for different types of risks so that action is rapid, ordered, controlled and coordinated. Above all, so that response is planned in advance, team is assign and ownership is clearly delegated. Finally, so that major part of the response is automated, saving time and cost and entire process is documented. Tuhund Crisis Management Module is not enabled by default. If you do not see it, please raise a request to get it turned on. Depending on the type of your Tuhund License it might be free or there might be some extra cost involved. Where is Tuhund Crisis Management Module in Tuhund ERP? The entry to Tuhund Crisis Management Module is right through your mail box. This is because, from the management perspective, any risk mitigation is less of work and more of coordination, communication and delegation. To get started, you will need to identify various anticipated crisis types and create one record for each type. 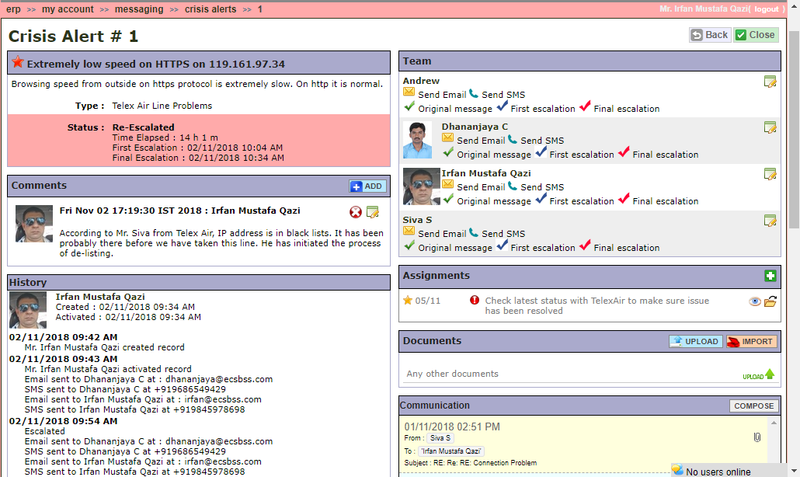 To create a crisis type, click on the manage button in the crisis alerts screen. You will see this button only if you the rights to manage crisis alerts (Security code ADM012). You might be wondering why we do not combine Airtel Line down and TelexAir line down into a single type, line down. The reason is that the responses as well as the response teams are different. For our examples, we will add Airtel support in team for Airtel line down, TelexAir support in team for TelexAir line down and our hardware team in server down. Level. Level refers to the criticality of the crisis. By default there are three levels; Low, Medium and High. For all our examples level is high. Please avoid the temptation of selecting high for every type. You might end up focusing more on less important issues and ignore other type of issues that are more important. Group name. A unique identifiable name for the type. For our example we will use the names Airtel Line Problems, Telex Air Line Problems and Server Down. Email . 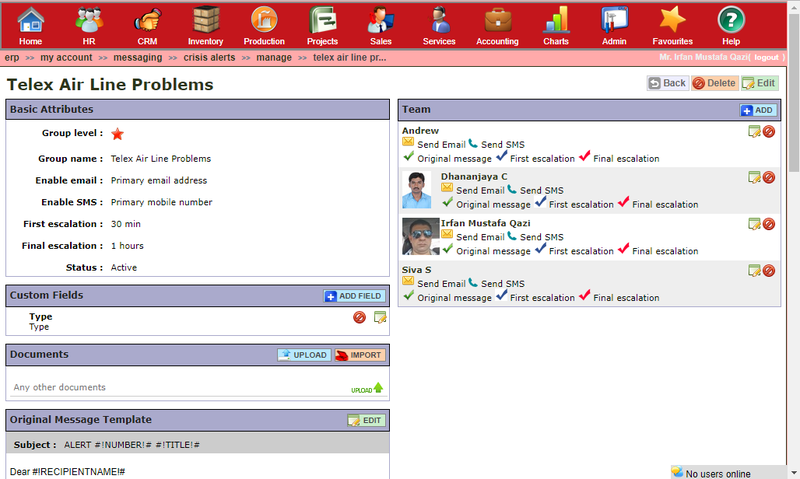 This option lets you select the number of email addresses for each team member on which the alert must be sent. There are a number of factors, outside the system, that can result in failure of email delivery. To ensure delivery, for critical resources, multiple email addresses are encouraged. SMS. This option let you select if the SMS should be sent and to how many mobile number for each team member. Even if a person uses a single number, which is almost always the case, you might add mobile number of spouse or other family member for highly critical issues like fire in the building, etc. First Escalation. After how long (minutes, hours or days) must be issue escalated to higher level if it is not resolved by then. Final Escalation. After how long (minutes, hours or days) must be issue re-escalated to higher level if it is not resolved by then. Senders. This option lets you specify who can enter the record. For our examples we will let just anybody and everybody to create an alert. Once data has been filled and form submitted, a record is created with other data set to defaults. Next step is to add the response team. You can choose from persons database. That means you can choose any person including ERP users, employees, customers, vendors, service provider or even outsiders as long as they exist in the database. After response team has been set, you can add custom fields as different data fields will be required for different types of issues. Custom fields added to a specific type of issue will be available for only issues of that type. You can add documents that might be needed, helpful or just have record value specific to that crisis type. Finally you might want to customize email and SMS messages. Let us start from the beginning. Go to your mail box and click on the Crisis Alerts button. You will reach Crisis Alerts screen. Click on add button to raise a new issue. Select type, enter a name, enter details and submit. Team will be auto-populated from the type and alerts will be sent based on the preset rules explained above. Specific assignments can also be created manually. These assignments will create their own notification alerts and will also show in users home page in the task list as well as in the Tuhund Mobile App. There is a comments section inside the crisis alert screen which can be used as a discussion board or just to keep track of developments. There is a communication section that keeps track of all the email exchanged (incoming and outgoing) that is specific or related to the issue. There is also a documents section to store all related documents. When the issue is resolved, it can be closed. There will be two additions to Tuhund Crisis Management Module that are already in our schedule. 1. Detailed reports including reports tied to resource performance. 2. Expenses incurred on fixing the issue including human resource cost and intangible costs.